Find artworks, auction results, sale prices and pictures of H.J. Mathiesin at auctions worldwide. 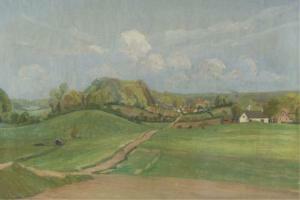 Country landscape with dirt road and town. Country landscape with dirt road and town in the distance. Signed on stretcher, possibly, "HJ Mathiesin". Oil on canvas. Signed At lower right. "HIM/1918". Gilt frame. 13 1/2" x 19 3/4". Frame: 17" x 23 1/2".